Our factory has been working in overdrive in order to catch up to our original schedule. 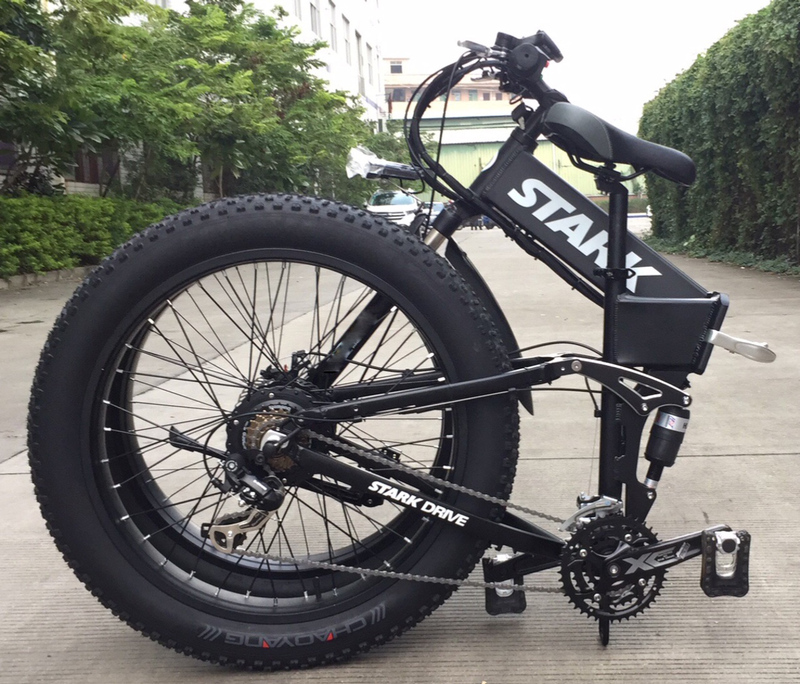 They managed to get the fat tire bikes for Sweden in record time and these are now on their way via boat to us with an anticipated landing date in Stockholm harbor December 13th. The batch 1 EU bikes are well on their way to our distribution center with an anticipated arrival date of November 15th. 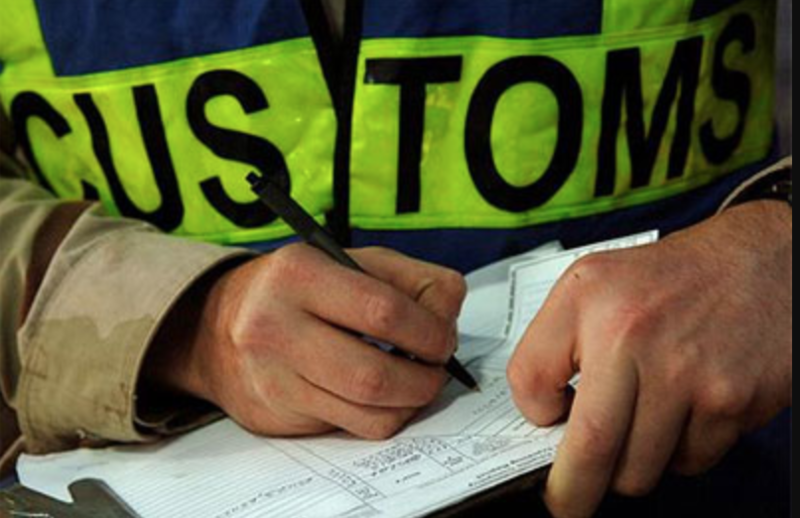 After landing in the EU, the bikes will be inspected by customs and then assigned individual tracking numbers by our delivery partners which will then be uploaded to your accounts. we are excited to announce we have finalized our shipping method for the USA and Canada. They will be leaving our factory by boat bound for California where they will be imported and then sent via UPS to each backer. Canadians note that you will be charged Duty on the bike as per Canadian Taxation law which you can confirm with Tax Canada. There is no Duty on electric bikes in the USA which is a good thing. Right now the factory is just finishing up the Fat Tire bikes for this shipment and the factory expects these to be compete November 15th and will leave shortly after that. Once the land in the USA, we will have tracking numbers available and these will be added to your account and to paypal. we have hired a new logistics partner and they have already proved their worth by finding shipping solutions to parts of the world we were originally having issues with. We now have no problem delivering to South America (note that some destinations are significantly more expensive to ship to which we are absorbing for now but future backers will have increased pricing for delivery). In all cases, the backer will have to act as the importer for their bike. More instructions on this will be sent to relevant backers. We now have solutions for New Zealand, Cook Islands, Fiji and more meaning that shortly your bikes will be sent out of our factory bound for your location. The same November 15th Date applies here for anticipated departure time. You too will act as the importer for the bikes meaning a visit to your local port. Our lawyer has last week officially sent the request for arbitration naming Indiegogo/Mate.bike as the defendants. Mate.bike chose not to settle with us when we sent them a demand letter for our losses due to their interference in our original campaign. This arbitration will be based on California law and can be held anywhere or even via teleconference. We will be claiming significant punitive damages for the pain and suffering caused to our team as well as the loss of good will from the part of our original backers as well as anyone else whom stumbled upon our campaign page on Indiegogo which surprising is still 'under review' 9 months later. Stark Drive Swedish Shipments Leave Factory! Fat Tire Neon! We are super excited that finally the Normal Tire, and Fat Tire bikes destined for Sweden, Iceland, Ireland, Norway, Switzerland. (Yes we are not sure why Switzerland was included in this shipment and not the EU shipment either but that is the way it is). Included in this shipment are also our working prototypes for the Stark Drive Mini which we are launching next year at an unbelievable price of 299 USD. For those of you in the USA/Canada, we have finalized the shipping method and the fat tire orders for these are still being finished at this point, they should be done and shipping by November 10th. Australia we have a shipping solution, however not for New Zealand, Cook Islands, Fiji as of yet. Batch 2 is Starting As of now and we are closing Batch 2 orders, Next is Batch 3. 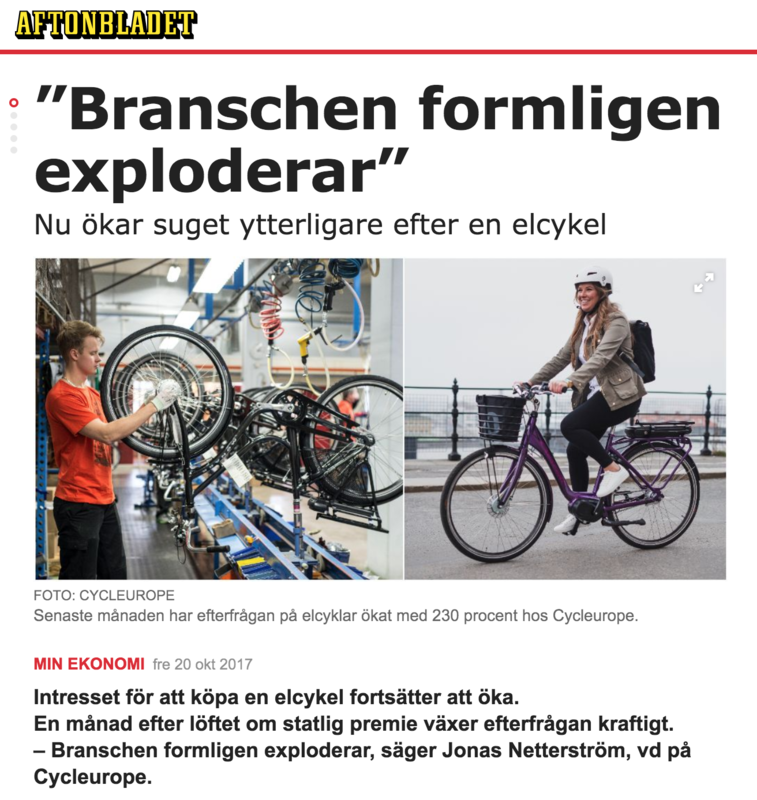 Please see the photos of the First Fat Tire bikes, Loading of all Bikes on the Sweden bound shipping container, and more! Not at all an unexpected result and our opinion at Stark Drive is that its fantastic that a green form of commuting is receiving government backing. We are super excited to announce that we have now hit 1000% of our original funding goal as of a few hours ago! What a ride its been and it nothing makes us happier then to see years of work come together to form a completed product that has and will be making thousands (and hopefully millions) of people around the world happy. Our company motto was as simple as it was altruistic: Manufacture the most affordable and well equipped electric bike in the world. Saying this proved to be much easier then actually accomplishing this goal with competitors out there not wanting a product such as ours on the market and trying their best to keep Stark Drive off the market. We can now confirm that our court date with Mate.bike for them slandering us publicly is set for March 21st 2018. I will personally be heading to Denmark to testify. We have also amended our original lawsuit to include them being FORCED to take down the inaccurate information from their website that they are the most affordable electric bike in the world. In that respect its not even only us that is much more affordable then Mate. There exists other brands such as Sondors, Wave, etc that are all more affordable. Are there any danes out there(?) that would like to act as my translator as my testimony apparently must be in danish and unfortunately all I can do is Swedish. The lawsuit against Mate for Fraudulently filing a DMCA with indiegogo and having our original campaign taken down is also proceeding with a demand letter for compensation sent to Mate last week. They have till the 23rd of October to respond and if they do not accept our generous settlement offer we will be proceeding with forced arbitration as per California Law, which is actually quite good as CA has some very strong Business Competition legislation on their books. for those of you on the fence about Stark Drive, you should make up your minds quickly as we are about to close batch 2 meaning that it would be a significantly longer wait if you decide to back Stark Drive after we close this batch. It would be no earlier then Spring 2018 delivery. We are going to receive some finished prototypes of Stark Drive Mini with the batch thats headed by boat to Sweden, if all is up to par as we expect it will be we will be producing our promotional launch video and launching early 2018. Anyone out there in Sweden that wants to be part of the video and does not mind heading over to Stockholm? Contact us at hello@starkdrive.com and you can be a star. Note in the photo below the upgraded pedals which use a much higher percentage of total pedal weight in metal instead of plastic. Note how well the wiring is routed as well as the protective sleeves they are placed in to protect them from ware and keep them looking neat. These are some of the fine touches we like to add to Stark Drive to not only make it utilitarian and dependable but also beautiful. As promised here are the videos of Stark Drive Mini in Action. It may be Mini but it totally Maximizes your ability to get around. EU Batch 1 Customs / Duties / Taxes - LISTEN UP. If you are one of the lucky backers in the first batch heading to the EU listen up. This will affect your delivery. You need to cover these as fast as possible otherwise your reward will be held at the distribution location and if held long enough, returned or distributed to another backer. We tried to get around having to do this (as our competitors have, but hey at least your bikes are at the distributor in the EU when we ask for these funds, unlike some competition) and instead having the delivery carrier charge these funds directly to the receiver but apparently that is not going to work for our logistics partners EU based partner. If you are contacted you should consider this a GOOD thing, it means your bike is about to arrive, you just need to submit the customs fees (which we are going to pay for you in advance) so that your bike is clear to leave the distribution location and come out to your home. That being said there is some really good news! we are super excited to report that we have gotten away with about 10% off this amount with some extremely complicated mathematics. thats right folks you heard it here first, we are getting away with a very modest amount of taxes for your new Stark Drive. We will be sending out the bills to all the receivers and a paypal account or bank account to send the funds to. You need to pay this immediately in order to not hold up your delivery. we have tied our computer systems to the ones at the distribution center so once we confirm payment they will know about it. This discount is currently only for the first batch im afraid, mainly due to the delays. we are super excited to announce that the Prototype Stark Drive Mini has now been complete and can be seen in testing below. Our aim for Stark Drive mini was four fold. We wanted it to be super light and portable so that you can easily take it on public transit. Stark Drive Mini will be as configurable as Stark Drive is with available upgrades to the motor, battery and a host of accessories that will be available when we launch it on kickstarter early next year (2018). The goal is to make electric bikes more available then ever before. We dont know of any purpose built (note: not frakensteined together) electric bike in this price bracket. Especially one that is as handsome as Stark Drive MIni. It will be available in White, Matte Black, and more exclusively Blue and Red. Since we are using the same manufacturing partner and there are no longer any chances for lovely competitors to file fraudulent DMCA claims against us, we will hold our schedule for production this time. As always, we are super appreciative of all of our hundreds (soon to be thousands) of backers out there and you should all give yourselves a pat on the back for altruistic attitude on life and helping to bring affordable electric transportation to the masses. We are waiting on word from our logistics partners for the delivery schedule for these deliveries. If anyone out there knows of an easy way to get our bikes to New Zealand and the Pacific Islands (such as the Cook Islands) we would love to hear from you. Our logistics partner in China has never shipped there before so its hard for them. We already have a quote for USA and Canada but our logistics partner is waiting on a second which they say could arrive faster and at a better price. We will update our blog as soon as we have news in this respect. Australia is not a problem for us currently. We are getting a lot of questions about when these are going out. As the first batch was a bit delayed (ie going out now) we anticipate that batch 2 will go out end of november. We will convey the latest information to you from the factory as we know it. Just wanted to write a quick post and alleviate any doubt that the first batch had not in fact left the factory. Here you can see a very short video of hundreds of Stark Drive's boxed and being loaded onto trucks destined for the logistics facilities. Apologies for the slight delay with the delayed posting of this post as this happened last week but we did not receive these images until today. that being: Launching an electric bike starting at 399USD as it was below their purchase price of their smaller bikes from the factory, we feel we maybe be a bit justified in being a little late. Now our goal is to fine tune the production process and to cut the delivery times by a factor of magnitude. Instead of 3 months delivery we are aiming for 4-5 days delivery time to our backers. We will have an update in an upcoming post about how we are going to do this. Stark Drive Box Ready Lined up. Some Minor Adjustments May Be Required. 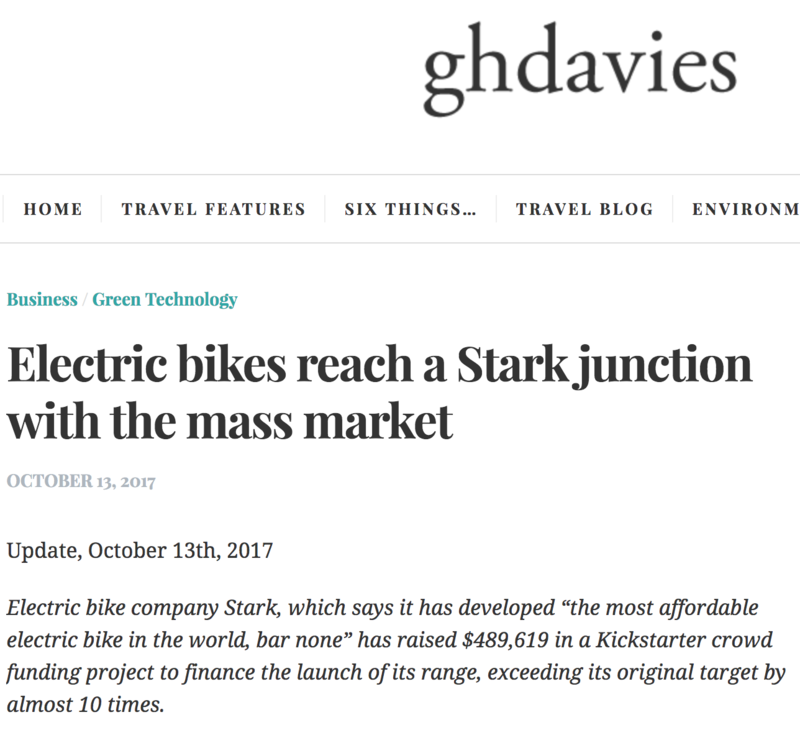 This article has been updated from the original article that was written on March 7th 2017.
what a pleasant surprise today when we were informed by one of our backers that google now rates our website as 1st when searching for 'Cheap Electric Bike' a terms we are not fond of as the bike itself is more affordable then the connotation that the word cheap affords however when searching for 'Affordable Electric Bike' on google we are the first hit that is not a review site! What a nice surprise, this leads us to the conclusion that there is now enough buzz around the inter-web to 'backrub' our company into a high enough ranking to achieve such a status! We are not done here folks! Next year we are launching a mini version of Stark Drive for an unbelievable starting price of $299. This bike will mainly be geared towards the public transit commuter with a much lighter total weight and a much smaller frame enabling one to easily carry it around instead of rolling it around which is what the majority would be doing with Stark Drive today. Watch for our new bike on Kickstarter. The prototypes will be arriving to us with the first delivery of Stark Drive which is anticipated sometime mid november. Thank you for all the Backing, Support, and kind words we have received from our backers, non backers, and the press. We are here to make electric bikes mainstream, not to make a buck.